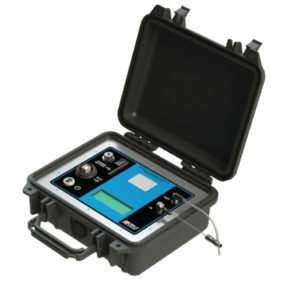 The Mobile Density Meter (MDM150) has the features you want at a price you can afford. Are you searching for an affordable and accurate method for measuring density, specific gravity or concentration in the field? Are you still using a hydrometer for monitoring density? Has a digital density meter been out of the budget? The Mobile Density Meter (MDM) is a rugged, accurate, affordable instrument for measuring density samples in your process. It is so rugged it can withstand waist high drops onto concrete. This product was developed to provide users, a self contained, portable, field proven, high performance and cost effective instrument for making spot density measurements. Think of it as a mobile laboratory density meter. The MDM150 uses the patented density sensing technology along with low power electronics and powerful software to create a very useful liquid density meter. All of this is packaged in a small, sealed plastic case for use in almost any environment. Along with an LCD display on the unit, there is software to allow the user to configure, display and record results using any desktop, laptop or tablet computer running Windows software and the ISS fluidic communication software. Density and temperature can be used in the device to calculate concentrations such as % alcohol in water, % glycol in water and sugar in water (BRIX). The MDM150 easily fits into a laboratory environment and is an economical alternative to dedicated laboratory density meter.